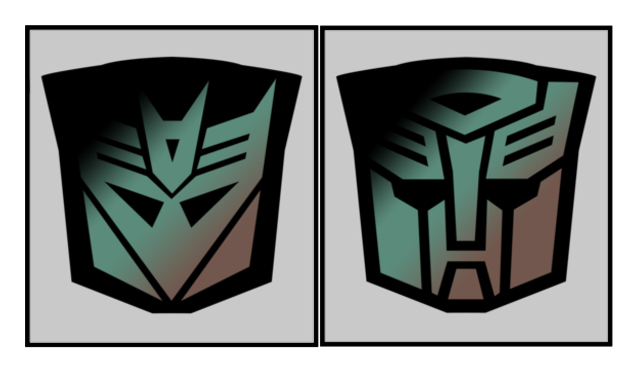 Jared Unzipped: How Do The Transformers Rubsign Stickers Work? Every child of the 1980's remembers the original Transformers toys. They featured these really cool, heat activated stickers that you could touch. Moving your finger back and forth across these rubsigns, as they're known, revealed the allegiance of the robot. Were they an Autobot or a Decepticon? All you had to do was check the rubsign! Shockwave's rubsign was on the left side while in blaster mode. I'd bet $20 he's a Decepticon. When's the last time you saw a purple Autobot? Implementing the rubsign was a novel idea by Hasbro, the creator and manufacturer of the Transformers. While the sticker served as a bit of a gimmick for the toys, it also acted as a mark of authenticity. Beginning in 1985, many toy competitors started to flood the market with cheap knock-off Transformers. The legally patented rubsign was in place to prove that a Transformer was authentic. At its core, the rubsign sticker is like a flat mood ring. Inside the sticker are thermochromic liquid crystals. These crystals change shape as the heat they're exposed to increases. As such, this molecular change reflects at different wavelengths of light. The more a rubsign sticker is heated up by touching it, the brighter it gets. Over time, as the rubsign cools down, the liquid crystals return to their original structure and lose their color. This is an original commercial from 1985 proclaiming the importance of the rubsign to indicate a genuine Transformers toy. Who knew that the Transformers were using cutting edge science in their implementation of the rubsign and fending off crooks at the same time? That's radical!